This is the list I wrote for our camping trip. I was naively and completely convinced that I had included absolutely everything I could possibly need, and would even go as far as feeling a little proud of myself for finally getting organised…. when it was pointed out that I had missed some vital items….our tent, some clothes and toiletries! Last year when we camped we found that T1D is not always a happy camper to say the least, so this year we are determined to make it behave, as it seems it must tag along. 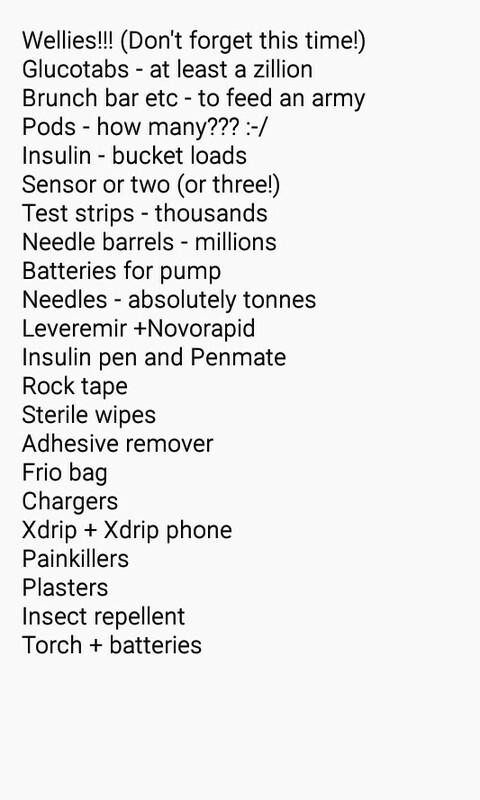 We will pack a tonne of glucose to fend off the heat and activity induced hypos and we have listened to tips of when and how much temporary basal rates to use, and found that rock tape might keep a pump or sensor in place for just a little longer before it falls off due to water and heat. So as we get ready to set off full of confidence, I cant help but stop and smile at my self and my naivety. Type 1 Diabetes often does this to us! Just as I think that we have cracked it in a certain area, whether carb counting or extended bolus, temporary basals or whatever, there is a hiccup with an unexpected high or low, and I am reminded how unpredictable type 1 diabetes can be! We are not the only ones in the world with T1D and if we run out of anything, we will be able to get some help. A few days camping, even though dealing with odd and unpredictable numbers, which may well be hard and annoying, will be worth it for the time, smiles and laughter whilst away.